Fri., July 20, 2018, 5:55 a.m.
Spokane 7, Salem-Keizer 5: J.P. Martinez went 2 for 5 with a homer and three RBIs and the visiting Indians (15-19) beat the Volcanoes (17-17) for their third-straight road win. 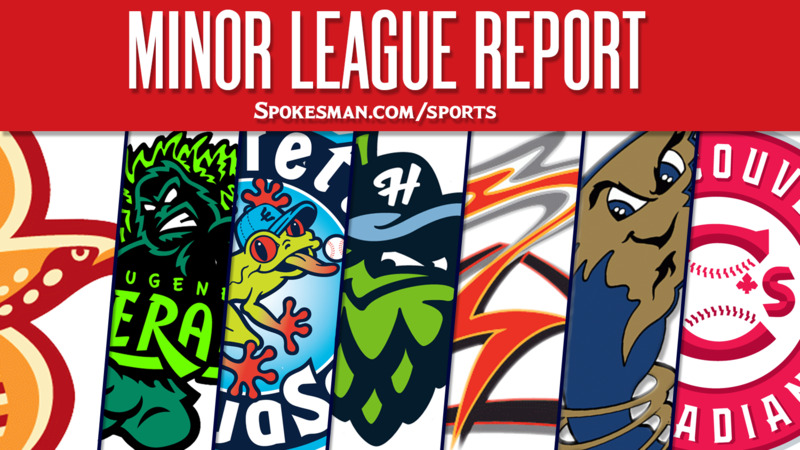 Curtis Terry and Jonah McReynolds added three hits apiece as Spokane pounded out 14 hits. Hans Crouse (3-1, 2.77) allowed four runs (three earned) on six hits and two walks with three strikeouts over 5.2 innings. Cole Uvila struck out two in a scoreless inning to earn his second save. Eugene 7, Tri-City 3: Nelson Velazquez went 2 for 4 with a double and two RBIs and the visiting Emeralds (12-22) handled the Dust Devils (16-18). Luis Vazquez and Tyler Durna both drove in a pair of runs for Eugene. Vancouver 5, Hillsboro 0: Four pitchers combined on a two-hitter and and the Canadians (17-17) shut out the visiting Hops (22-12). Sean Wymer (2-2) struck out four over three innings, as did Fitz Stadler. Vinny Capra smacked a solo homer and scored twice for Vancouver. Everett 17, Boise 2: Ryne Ogren homered twice with five RBIs and the visiting AquaSox (18-160 clubbed the Hawks (19-15). Charlie McConnell went 3 for 5 with a solo homer, four runs and three RBIs and Geoandry Montilla added a solo homer for Everett. Boise made six errors. The Rangers acquired left-handed starter Tyler Thomas from the Chicago Cubs organization in exchange for MLB pitcher Jesse Chavez. Thomas was 3-5 with a 2.88 ERA with 81 strikeouts over 75 innings in 14 starts for Low-A South Bend this season. Thomas played for Eugene last season and went 1-0 with a 2.33 ERA in 11 games, all in relief. e struck out 24 in 19.1 innings. Round Rock (AAA) 4, Colorado Springs 3: Hunter Cole hit a solo homer and the visiting Express (46-51) edged the Sky Sox. Drew Robinson doubled and tripled for Round Rock. Adrian Sampson (5-3) allowed three runs on seven hits with three strikeouts over seven innings. San Antonio 7, Frisco (AA) 4: Fernando Tatis Jr. hit a solo homer, his 16th, and the visiting Missions (56-39) handled the RoughRiders (40-57). C.D. Pelham allowed a run on two hits and two walks in one inning with no strikeouts and Chuck Moorman hit a solo homer for Frisco. Frederick 7, Down East (High-A) 2: Preston Palmeiro hit a two-run home run, his 13th, and drove in three and the Keys (44-530 downed the visiting Wood Ducks (44-54). Leody Taveras went 0 for 4 and is hitting .233 for Down East. Joe Palumbo (0-2) was roughed up for four runs on six hits and a walk over three innings. Hickory (Low-A) 14, Kannapolis 10: Pedro Gonzalez went 3 for 5 with a homer and two RBIs and the Crawdads (45-49) held off the visiting Intimidators (52-41). Hickory put up seven in the second inning. Tyreque Reed and Sam Huff added home runs while Ryan Dorow and Preston Scott drove in three runs apiece. Published: July 20, 2018, 5:55 a.m.